Whether analyzing data is part of your everyday job or one of your projects needs specific data analysis, the same questions arise: What tools are the most suited for the task? Which techniques are the most adapted? What are the numbers really saying? Are they meaningful? 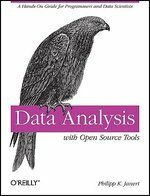 If those questions are familiar to you, Data Analysis with Open Source Tools by Philipp K Janert might be of great interest. This book is perfect for hands-on readers, wanting to achieve specific goals without getting entangled in formal definitions by getting right to the point. Here is an analogy: a Common Kite is depicted on the front cover of the book and as the bird waiting for its prey, you’ll be able to analyse the situation, understand it and take a clear decision after this read. The book starts by giving graphical representations of several types of data sets. This is particularly useful to truly understand what we are working with, notably for visual readers. It gives important landmarks for further manipulations with the data. Indeed, within each sections (18 of them), there is a subsection called Workshop where the reader gets his hands dirty on examples. The main tools used are Python and its libraries (NumPy, matplotlib, scipy, etc), R and gnuplot. On the negative side, although several practical examples are given in each section, no files are provided so readers can follow exactly the same example on their side. More advanced techniques are given later in the book going from clustering to data mining, but the author always find a way to prune away non essential concepts and focusing on what the reader really needs to know. In short, I recommend this book to anyone wanting to give a little more kick to the tremendous amount of data surrounding them. Personal advice and little tricks make the read a most enjoyable one.